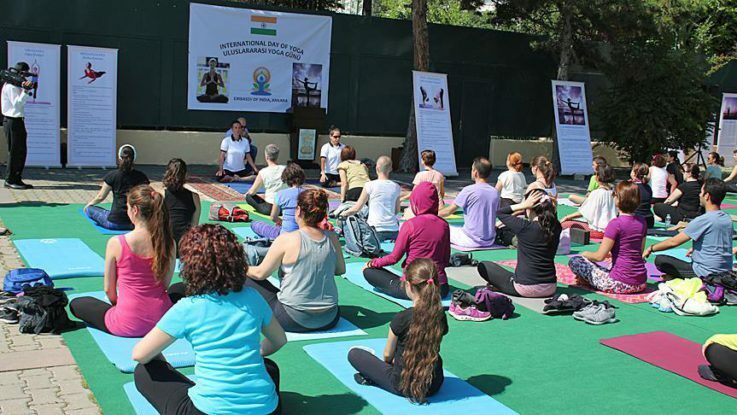 Ankara celebrated the International Day of Yoga at the Embassy of India on Saturday. Over 150 people participated gathered to participate in meditation and yoga sessions, according to embassy officials. “It can be for a spiritual relief, a ritual exercise, or discipline, everyone is aware of the benefits of yoga. International Yoga Day is about brotherhood and peace,” Ambassador Rahul Kulshreshth, said in a speech. An hourlong yoga warm-up was launched under the guidance of Rajeev Rajendran. Yoga experts Suna Kucukcinar and Bahar Demirtola then began their basic yoga and meditation session, speaking both in English and Turkish, sparking the crowd’s enthusiasm. Kucukcinar and Demirtola invited the participants to the embassy’s auditorium for a presentation on different styles of yoga. International Yoga Day was declared by the UN General Assembly in 2014. This year it will continue to be commemorated until the end of next week in Istanbul and Ankara.